Busy. That’s one word that defines most of us, and even though we might think things will slow down tomorrow, next week, or next year, the truth is, we remain busy. In fact, when we ask patients why they haven’t been flossing, they usually tell us that they didn’t have the time. We believe that you can still have a healthy smile even with a busy schedule. 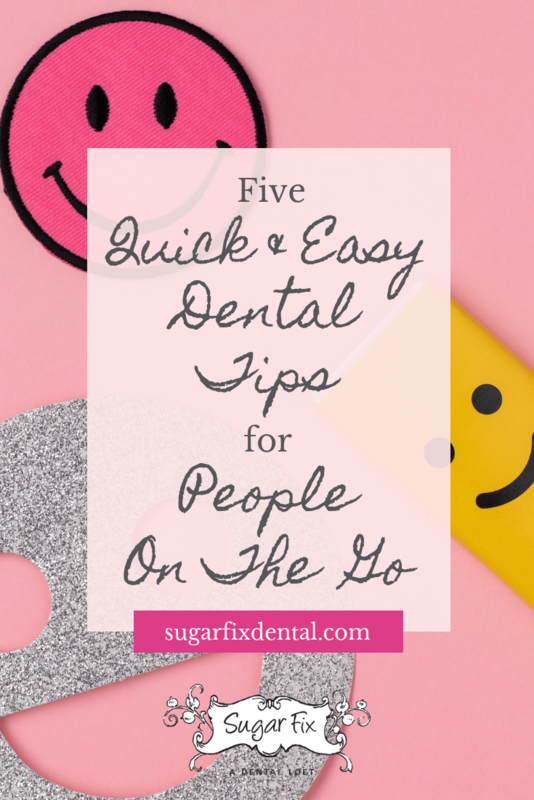 That’s why we wanted to share these five easy and quick dental tips for people on the go! Taking better care of your teeth doesn’t always mean spending more time. Sometimes it just means having the right tools for the job… and that starts with the right brush! The first of our quick dental tips is to look for a brush that’s small enough to reach into all of the crevices of your teeth, especially those pesky molars! A lot of people think that adults need big brushes, but actually, you should look for a small or medium-sized brush so you can really get into all those little nooks and crannies! If your teeth haven’t been feeling as clean as you’d like, try swapping out your brush for something a little bit smaller. Are you cleaning your tongue? You should be! Even after you brush, bacteria can still remain on the tongue. At the very least, use your toothbrush to gently brush your tongue at least once each day. If you want to get more serious about a clean mouth (and give yourself fresher breath at the same time) a tongue scraper can make the job a breeze! There are lots of options out there, so pick one up and see how this one quick task can make a huge difference in your life! You often hear us say that you can still enjoy sweets (I mean, our name is Sugar Fix, after all) but you HAVE to brush — or at least rinse really well — afterward. Ideally, it’s best to wait an hour after eating anything before you brush. Why? If the food is a high-acid food, brushing right after could soften the tooth enamel. If you wait an hour, you give the saliva time to break down and neutralize the acids first. As we mentioned in the first paragraph, flossing is usually the first thing to go when people get busy. This is a shame because flossing is really the only way to remove plaque between the teeth. If you’re looking for an easy dental tip to help you floss better, we recommend trying a floss alternative! We love interdental brushes, water flossers, and floss picks. They all do a super great job of cleaning between the teeth. Ask any dentist and they’ll tell you they don’t really care which tool you use, as long as you’re getting between those teeth at least once per day! This one might seem counter-intuitive. If you’re busy, finding the time to come in for your six month cleaning might seem impossible! We want you to think about it like putting money into your “time bank.” Sure, the appointment might take an hour out of your day, but that built-up plaque and tartar can really only be removed by a dental professional. No matter how much you brush and floss, if you don’t get the plaque and tartar removed regularly, you’ll run into much bigger issues down the road which take a lot more time and money to fix. An hour today is much better than several hours down the road, trust us! We make it easy, too! You can set up your appointment with us online by clicking here! Is it time for your regular cleaning or are you interested in discussing a smile makeover? We’d love to hear from you! You can reach us at 773-883-1818 or you can schedule a consultation or appointment right on our website!